Don't want a full size greenhouse, but do want to start your seeds early before the last possible cold spell or extend your growing season in the fall? Use a Cold-Frame! 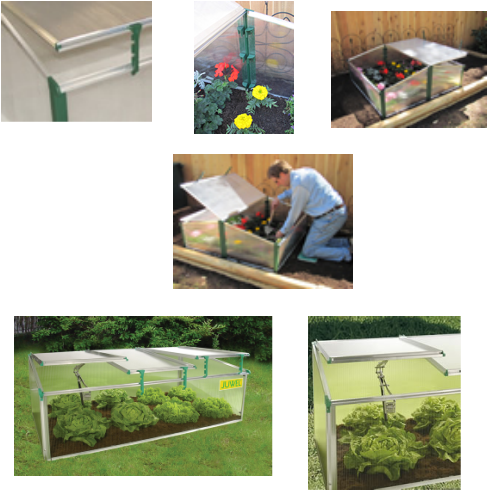 Juwel Cold-frames are easy to assemble in just 5 minutes, no tools needed. Cold frames can be used during the Spring season, then use in the summer months to help discourage rabbits, deer and other pests. In many areas cold frames can be used year round for growing cool weather plants. Also it can disassemble and store (flat) for the rest of the year. Requires minimal storage space. 2, one gallon plastic water bottles, sprayed black in the back of the cold-frame. Fill with water. During the day, the sun warms the water and at night it gives off enough warmth to prevent plants from freezing. I grow chard, lettuce, spinach, leeks and sweet basil right through the winter. 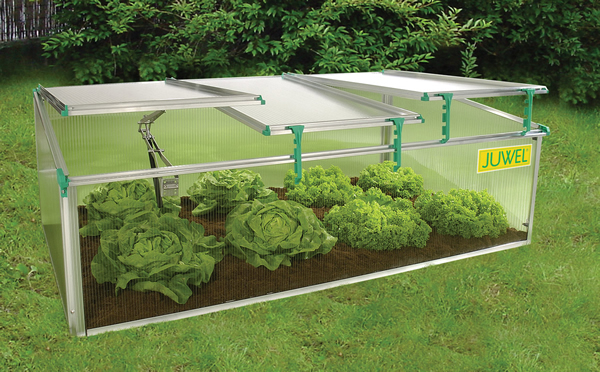 During the summer, I use the automatic opener and grow warm weather greens in the Cold-Frame. When it starts to get hot, I throw a piece of shade cloth over the Cold Frame and leave the doors open several inches using the clips. Now, I can grow greens through the summer and the deer can't eat them." Top quality Austrian cold-frame. Easy to assemble.